The 1620s were a time of political and religious turmoil in England. The protracted struggle for supremacy between monarch and Parliament reached new heights in 1629, when Charles I disbanded the rival body and ruled alone for 11 years. Official pressure was also applied on religious dissenters, notably the Pilgrims and the Puritans. Some were imprisoned for their nonconformist views and others lost lucrative official positions. In 1628, a group of distinguished Puritan businessmen formed a venture named the Governor and Company of Massachusetts Bay, which was initially conceived as a profit-making endeavor in the New World. A land grant was received from the Council of New England, the successor to the ineffective Virginia Company of Plymouth, providing rights to the area between the Charles and Merrimack rivers and westward to the Pacific Ocean. Preliminary voyages were made in 1628 and 1629, and resulted in the establishment of a small colony on Cape Ann and later at Salem. ... all that part of America lying and being in breadth from 40 degrees north latitude ... to 48 degrees of the said north latitude inclusive and in length of and within all the breadth aforesaid throughout the mainlands from sea to sea. ... yielding and paying unto Us, Our Heirs, and Successors the fiftieth part of the ore of gold and silver which shall, from time to time and at all times hereafter, happen to be found, gotten, had, and obtained in any of the said lands. While still in England, the company members signed the Cambridge Agreement (1629), in which they agreed to undertake the rigors of the Atlantic voyage if full authority over the charter and colony would be vested in the members themselves. Those stockholders who did not wish to migrate sold their shares to emigrants. Beginning in 1630, Governor John Winthrop, with the company charter tightly in hand, guided the arrival of nearly 1000 colonists to the New World. The initial parties stopped first at Salem, but soon established a permanent settlement on the Shawmut Peninsula of Massachusetts Bay (later to be called Boston). Initially, circumstances were extremely difficult - approximately 200 settlers died the first year and a similar number returned to England in the spring of 1631. Gradual improvements in living conditions led to an influx of new colonists, mainly English Puritans, that totaled more than 20,000 over the next decade. New settlements soon fanned out from Boston — Newtown (later Cambridge), Lexington, Concord, Watertown, Charlestown, Dorchester, and others dotted the map. 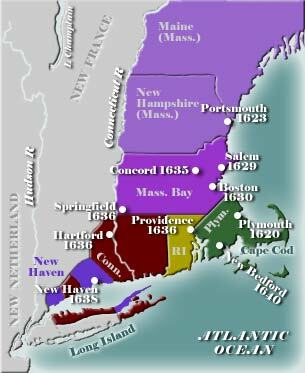 Massachusetts differed markedly from Plymouth, its neighbor 40 miles to the south. The Puritan immigrants, as a whole, had been more prominent in England and were more highly educated. All classes, from gentleman to common laborer, were represented. The stamp of Puritanism was felt throughout the entire community. In the political realm, the requirement for becoming a “freeman" (meaning a stockholder in the company and a voter) was membership in the church, not land ownership as was the case in other colonies. The Puritans of Massachusetts Bay were Calvinists, but with their own points of emphasis. They held the traditional belief that all mankind merited eternal damnation, but a merciful God had graciously granted salvation to a few, the Elect. However, they believed that salvation came at a price — God’s chosen people were bound by a covenant (contract) to see to the enforcement of God’s laws in society. Failure to do so would result in stern punishment, much as the Biblical Hebrews, an earlier chosen people, had been disciplined. Good behavior would not win salvation for the Massachusetts Puritans, but it would help them in their current lives to avoid wars, famines, and other forms of divine wrath. This concern about proper behavior resulted in an abiding interest in the activities of one's neighbors. Religious orthodoxy was challenged from time to time by various members of the community. Thomas Morton provided what appears to today's observer as an almost comic alternative to the stern Puritan society. More thoughtful challenges came from Roger Williams and Anne Hutchinson. As time passed, church membership declined as fewer people were able to offer proof of a conversion experience, which would convince themselves and others of their inclusion among the elect. This troublesome situation was remedied by the adoption of the Half-Way Covenant by many New England congregations. But our question is concerning Gynecandrical Dancing, or that which is commonly called Mixt or Promiscuous Dancing, viz. of Men and Women (be they elder or younger persons) together: Now this we affirm to be utterly unlawful, and that it cannot be tollerated in such a place as New-England, without great Sin. The Massachusetts Bay Company and the colony were one and the same until 1684, when the charter was taken away. Later, in 1691, a new royal charter was granted to Massachusetts; the Plymouth Colony and Maine were absorbed. Still referring to itself as the "Colony of Massachusetts Bay," the General Court declared on January 23, 1776, that the royal governor Gage was no longer in charge and that the colony would be responsible for its own management until the King appointed an acceptable governor. Near the end of the war, Massachusetts produced a constitution for the "Commonwealth of Massachusetts," which is the name it has retained to the present time. That constitution, ratified on June 15, 1780, remains the oldest written constitution in continuous use in the world. The word Massachusetts is taken from a Native American word for "great hills," referring to the Blue Hills near Boston. Quotes regarding Massachusetts Bay Colony. Hidden History of Maine by Harry Gratwick. The Puritan Dilemma: The Story of John Winthrop by Edmund S. Morgan. Mistress Bradstreet: The Untold Life of America's First Poet by Charlotte Gordon. The Works of Anne Bradstreet by Anne Bradstreet. Every Day Life in the Massachusetts Bay Colony by George Francis Dow.